Police officers on foot patrol in high-crime areas will ride bicycles to help boost their visibility and mobility in the neighborhoods. 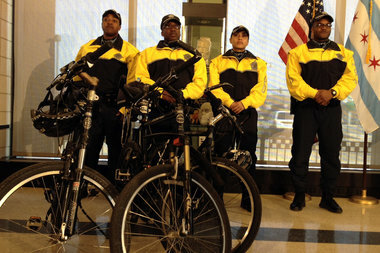 More than one-third of the 360 officers assigned to foot patrol in "Operation Impact" have been equipped with the police bikes since April 1, Chicago Police Supt. Garry McCarthy said. Scattered throughout the city, the so-called "impact zones" represent 3 percent of the city's geography, but accounted for "almost 20 percent of the robberies and shootings" in the city over the last three years, McCarthy said. "So it's not just perception, it's a reality of safety," he said. The top cop pointed to a recent bust of a driver who was talking on a cellphone and flicked a joint out of the car while speeding away. The bike cops' mobility and hustle, he said, led to an arrest and charges of a stolen car and driving with a revoked license. "A little vignette, true, but it was only possible because these officers were on bike patrol," McCarthy said. Leo Panepinto, police commander in the Southwest Side's Deering District, said there are three impact zones in the district, which encompasses 14 square miles and serves a number of neighborhoods, including Armour Square, Bridgeport, Canaryville, McKinley Park and Back of the Yards. They include Ashland and Damen avenues between 43rd and 47th streets, Racine Avenue to Wallace Street between 51st and 55th streets, and Ashland and Damen avenue between 52nd and 59th streets.